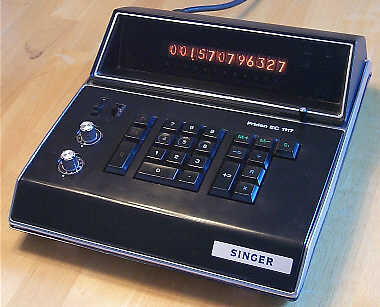 The 1117 is one of the long-lived and successful lines of Singer/Friden 111x-line of desktop electronic calculators. The span of the 111x-series covers four generations of calculator design. The first generation calculator in the line, the Friden 1112 utilized discrete transistor circuitry -- Integrated Circuits simply weren't practical for use in a calculator at the time this machine was designed. The next generation utilized early small and medium-scale Metal Oxide Semiconductor (MOS) Integrated Circuit technology. These machines were the 1113, 1114, 1115, and 1116 models. The third generation machines (the 1117 and 1118) utilized early Large-Scale Integration (LSI) chipsets. 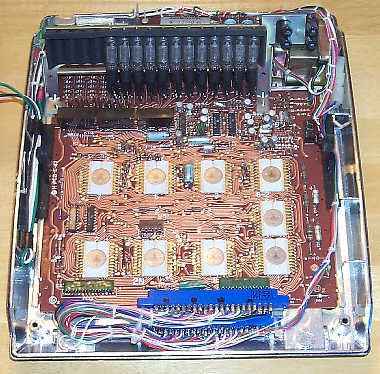 The last generation of the 111x-series were the "A" version calculators (the only currently-known example being the 1117A), which utilized further advances in LSI technology to shrink the chip count from nine chips to only three. Like all of the calculators in the 111x-series, the 1117 was designed and manufactured for Singer/Friden by Japanese electronics giant Hitachi. Hitachi marketed their version of this machine, the ELCA-42, in Asia and Europe. The Hitachi machine was functionally identical to the Friden 1117, but had subtle cabinet and color-scheme differences. The 1117 was the "little brother" to the 1118. The 1117 provides twelve digits of capacity (versus fourteen on the 1118), and a single memory accumulator register (versus two for the 1118). The reduced capability of the 1117 allowed it to sell for $150 less than the 1117, with a retail price of $445. Both the 1117, 1117A, and 1118 share an identical cabinet base, upper cabinet assembly, mechanical layout, and power supply. Only the keyboard bezel, main circuit board and keyboard assembly make up the differences between the 1117 and 1118. Both the 1117 and 1118 weigh in at 7.7 pounds, and share the same physical dimensions. The 1117, 1117A, and 1118 all have a built-in carrying handle that latches into the bottom of the case, and can be folded out for easy portability. Though the 1117 and 1118 differ in functionality, both machines are built using the same early Hitachi LSI chipset. It appears that this chipset was designed to be rather general in nature, with a each chip carrying out a specific part of an overall calculator core. Both the 1117 and 1118 share a common core of chips, with two additional chips in 1118 that apparently add the extra capabilities of that machine. The common core LSI devices present in both the 1117 and 1118 are the HD3201, HD3202, HN3202, HD3203, HD3205, HD3206, and HD3207. 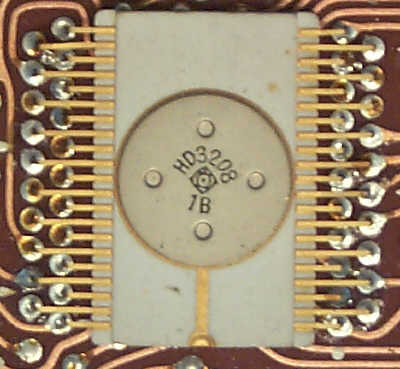 The 1118 adds an HD3208, and an additional HD3206 chip (to the two that are in the 1117 design), which leads me to believe that perhaps the HD3206 chip may function as a general purpose register, with the additional HD3206 chip in the 1118 providing the storage for the second memory register. No HD3204 chip appears in either calculator which leads one to wonder why this part number was skipped (or not used in these particular designs). 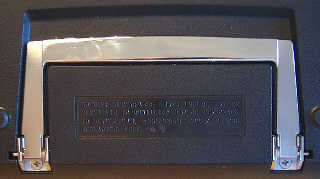 Hitachi marketed their own calculators in Japan and Europe, and perhaps there were models which utilized the chipset to provide additional functions. Maybe the HD3204 was used in one of these calculators. Unfortunately, these Hitachi-branded calculators have proven rather elusive. 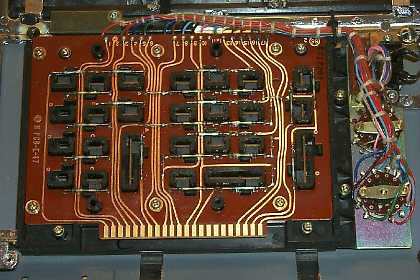 It is interesting to note that the main circuit board for both the 1117 and 1118 have areas on the circuit boards for a full sixteen Nixie tubes -- perhaps the general chipset had the capability of providing sixteen digits of capacity, but were externally 'tuned down' through the use of jumpers or external logic to operate at different levels of capacity. Unfortunately, I have been unable to find any data on these old chips, so statements as to the functionality or logical partitioning of the ICs is certainly no better than an educated guess. If anyone out there has any old (1970/1971) Hitachi Integrated Circuit data that may have specifications listed for these old chips, I would very much like to hear from you. Along with the nine LSI chips in the 1117, the machine uses five HD3113 small-scale integrated circuits in Dual-Inline packages as glue logic. 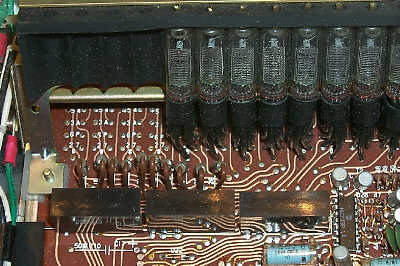 The cathodes of the Nixie tubes are driven by a compliment of three hybrid devices (packaged in black epoxy), while the anodes are driven by discrete transistor driver circuitry. The display uses Hitachi CD-90 Nixie tubes with 1/2-inch digits, and right-hand decimal point. The 1117 is a fixed-decimal machine, with the decimal point location set by the lower rotary knob on the keyboard panel. The decimal point may be set at 0 through 9 digits behind the decimal point. Overflow occurs if more than the selected number if digits is entered behind the decimal point. A three-position slide switch on the keyboard panel selects the rounding mode of the calculator. The upper-most setting of this switch forces all results to be rounded up at the least significant digit behind the decimal point. In such case, 1 ÷ 3 would result in 0.333334 (with decimal point set at 6 digits), and 2 ÷ 3 would give 0.666667. The middle selection of the rounding switch rounds up or down, depending on the (not displayed) digit behind the least significant digit on the display. If this digit is four or below, the result is left alone. If it is five or above, the result is rounded up. In this case, 1 ÷ 3 would give 0.333333, and 2 ÷ 3 would give 0.666667. Lastly, if the rounding control is set to the lower-most position, rounding is ignored, with 1 ÷ 3 giving 0.333333 and 2 ÷ 3 resulting in 0.666666. Another rotary knob on the keyboard panel selects various operating modes of the calculator. The switch has four positions. The first position selects no special functions. When the switch is in this position, the calculator operates normally. The second position of the knob selects automatic summing of all results generated by the "+=" key into the memory register. This is useful for calculating averages, sums of products, and other statistical functions. The third position of this switch enables the use of a constant for multiplication and division. The constant is automatically entered when the second number of a multiplication or division problem is entered. Subsequent to the entry of the constant, further calculations with the constant can be performed by entering a first number for the calculation, and pressing the "+=" key to calculate the result. The last position on the mode control knob provides a combination of both the second and third settings...automatic constant on multiplication and division, and automatic accumulation of results into the memory register. The 1117 uses the same arrangement for display of the sign of the number in the display, overflow, and memory status indication as the 1118 and 1117A. Three small neon indicators are situated at the right end of the display, with labels on the panel that indicate "NEG" (for negative number indication), "UDF" (for "UnDeFined"), which lights up in the event of an error or overflow condition, and "M1", which lights to indicate that the memory register has non-zero content. In the case of an overflow or error condition (for example, division by zero), the UDF indicator lights, and the input from the keyboard is ignored until the "C" key is pressed to clear the calculator. The keyboard of the machine is quite straight-forward. The keys are made from high-quality black plastic, with moulded-in colored nomenclature. The keyboard hardware uses the tried-and-true magnetically-activated reed switches for simplicity and reliability. The keys are grouped into three areas, with the left-most area controlling overhead functions, such as recalling the memory register to the display (T1) and clearing the memory register, clearing the current entry (CE), and clearing the calculator (C). The "C" key clears any error condition, and zeroes out the working registers, but leaves the memory register intact. The second group of keys is for numeric entry. The number keypad is organized in conventional fashion, with a double-wide zero key. The "4", "5", and "6" keys have moulded-in depressions in them for touch location. 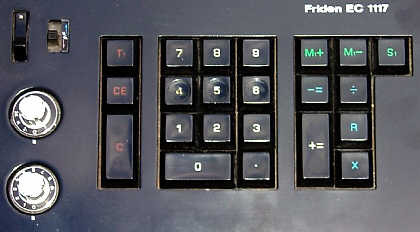 The last grouing of keys control the math operations and memory functions of the 1117. The "+=" and "-=" keys are used for adding and subtracting. The "+=" key is also used for finishing multiplication and division operations. The "M1+" key adds the content of the display to the memory register, leaving the display untouched. The "M1-" key subtracts the content of the display from the memory register. The "S1" key stores recalls the content of the memory register to the display, leaving the memory register intact. The "R" key swaps the position of the operands of multiplication and division operations. Lastly, the "X" and "÷" keys are used to inform the calculator that a multiplication or division operation is to be performed. The 1117 is just slightly faster than the 1118, probably because it has two less digits of capacity to deal with. All 9's divided by one takes about 1/4 second to complete. During calculations the Nixie tubes are left active, but the machine calculates quickly enough that all that is noted is a slight flickering of the digits while the machine is generating the result.